I have a Field (Inv:What) declared in my DCT as Option. When my window opens I want to assign and populate a Value to Inv:What depending on some options. Then it must show the correct Option as filled in on the window. It never gets the value. If you’re using ABC, you can put your code in the Browse.PrimeRecord method. If, for some reason, it must be in the update form itself, then use the ThisWindow.PrimeFields method. Or use a dictionary trigger. It put me on the right. I had it in the wrong embed. I cleared it in another embed by mistake. LOL Where have we seen that before? Wait just about everywhere. I’m almost certain there’s a special CPU instruction for ‘Increment and reset to zero’. 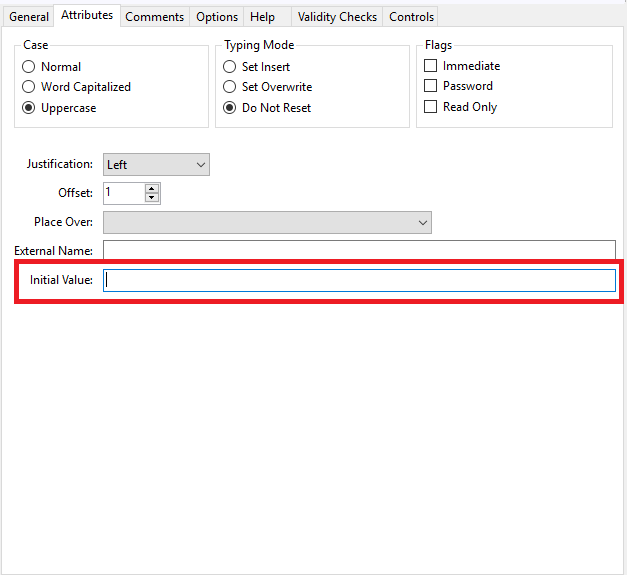 You can also set the initial value on your DCT under attributes tab.